Doha, QATAR – Qatar Airways today revealed that Copenhagen and Barcelona will join the airline’s ever-expanding route network during the airline’s summer schedule which begins at the end of March 2010. The announcement follows months of industry speculation over the Doha-based carrier’s plans to launch two new unnamed European destinations. Commencement of four weekly flights to Copenhagen, the capital city of Denmark, will see the airline significantly increase its Scandinavian presence. Qatar Airways currently serves the neighbouring Swedish capital Stockholm non-stop from Doha, a route launched two years ago. The airline recently announced that it will boost capacity on its Stockholm route with frequency increasing to daily from March next year. With Copenhagen being added, Qatar Airways will further strengthen its operations in Scandinavia, cementing its place in the market as the only GCC carrier to serve the region. Copenhagen as Denmark’s largest city, is a major regional centre of culture, business, media and science. With the largest airport in Scandinavia, Copenhagen ranks as a popular hub for regional headquarters of large international companies. Last year, Copenhagen was singled out as the Most Liveable City in the World by leading international lifestyle magazine, Monocle, and is also considered one of the world’s most environmentally friendly cities. Barcelona will become Qatar Airways’ second city served in Spain, after Madrid, when daily services commence to the popular Mediterranean port city. The new route underscores a growing commitment by the airline to the Spanish market following earlier capacity increases to the country’s capital city of Madrid. 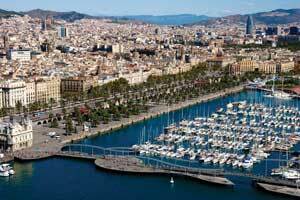 As Spain’s second largest city, Barcelona is a popular tourist centre on the Mediterranean coastline. It is home to one of Europe’s main ports and has a thriving economic base due largely to its importance in finance, commerce, media, entertainment, arts and international trade. News of the two route announcements comes just days after Qatar Airways unveiled plans to launch flights to Bengaluru (Bangalore) in southern India, the Turkish capital Ankara and Japan’s capital city of Tokyo over an eight-week period starting in February 2010. The airline also plans to launch flights to Sydney, its second Australian destination, during 2010. With six new routes on the horizon, Qatar Airways will increase its global portfolio from 85 to 91 diverse business and leisure cities across Europe, Middle East, Africa, South Asia, Far East, North America and Australasia. The carrier currently operates a modern fleet of 76 aircraft. Qatar Airways Chief Executive Officer Akbar Al Baker said: “The addition of the European cities of Copenhagen and Barcelona, along with Ankara which we announced a few days ago, follows the airline’s strategy to expand its operations to diverse and underserved cities from the Gulf. “By adding these three cities to our route network, we are demonstrating our commitment to expanding our presence in Europe and introduce new travellers to our award-winning Five-star services, as well as provide our existing passengers with even more destinations and convenient travel options. “The airline’s business model continues to prove successful and Qatar Airways is looking forward to yet another eventful year, with 2010 shaping up to being one of our busiest,” he added.